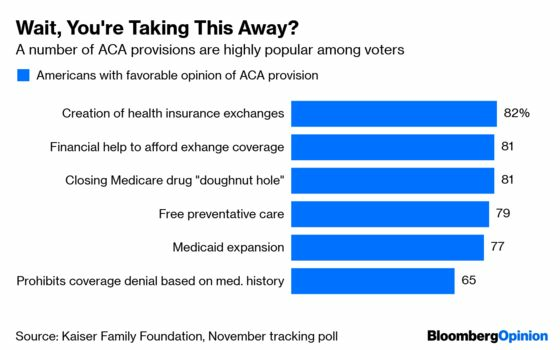 (Bloomberg Opinion) -- So much for President Donald Trump’s renewed health-policy push. It was only a week or so ago that his Department of Justice announced it would fully back a lawsuit aimed at repealing the Affordable Care Act, a move Trump brought further attention to by calling Republicans “the party of health care” while promising a superior plan. Now he’s punting, saying this great new plan — which appears to be a version of a previous failed effort — won’t come up for a vote until at least 2021, and only if he wins the election. The lawsuit already helped Democrats by reviving threats to popular protections for people with pre-existing conditions, a rallying point that contributed to their winning back the House in 2018. But the decision to put off formulating an alternative plan is even more reckless from both a political and policy perspective. The DOJ is now actively supporting a suit that could see the ACA struck down and millions lose their coverage well before 2021, with no firm Republican alternative in sight. In short, the GOP is gambling with the stability of the U.S. health-care system because its best health policy ideas can’t pass on their own merits. This sounds like an uncharitable analysis. It’s not. The GOP’s first repeal-and-replace bill in 2017 passed the House but failed in the Senate, which was spooked by the plan’s big cuts to coverage and regulations. A group of senators later proposed an alternative bill known as Graham-Cassidy, which would have kicked diminished funds to states to design their own plans. Senate Republicans never even brought it up for a vote after the nonpartisan Congressional Budget Office found that it would result in massive cuts to Medicaid and significant coverage losses. The ACA as a whole still has middling polling numbers. But key provisions that Republican proposals like Graham-Cassidy have targeted are extremely popular. The Trump-backed lawsuit would throw out the entire thing. The party hasn’t come up with anything better. President Trump’s 2020 budget endorsed Graham-Cassidy and Utah Senator Mitt Romney said Monday evening that a new replacement plan would be based on that legislation. Trump and other Republicans have claimed that the party’s new plan will protect people with pre-existing conditions. If they’re slapping a new coat of paint on Graham-Cassidy, then they aren’t telling the truth. That bill offered a significant incentive for states to discriminate against sicker Americans and cut coverage, and a path to do so. Republicans don’t want to vote on a similar plan. They don’t even want to provide details they can be tied to; hence, the decision to be vague and misleading with health coverage for nearly 20 million Americans at risk from its lawsuit. Campaigning on vague plans is nothing new. But doing so while tossing a legal bomb at the American health-care system is irresponsible.